Silver can be frustrating for holders of the physical metal. Investors are losing both money and opportunity. The last three years of sideways price action have been frustrating for the bulls. Silver can be frustrating for holders of the physical metal. Stuck in a sideways pattern since 2014, silver has been oscillating between support at roughly $14.00 per ounce and resistance at $21.00 per ounce. This turns holding silver into dead money at best. Investors owning a substantial amount of physical silver are not only paying storage costs, they are missing out on interest to be made in this higher-rate environment. Investors are losing both money and opportunity. But what if there was a way to keep upside exposure to silver without the costs of storing and insuring it? What if you could also earn interest on the side - even in a "worst case" scenario? We'll explore such a strategy later in this report and show you how it's possible to "rent" silver for pennies on the dollar, freeing up capital to earn virtually risk-free interest elsewhere. The last three years of sideways price action have been frustrating for the bulls. The coming month could be equally frustrating for the bears. Silver is unloved and forgotten. But as the chart below illustrates, it is also extremely cheap on a long-term basis. Bull markets in silver are almost never caused by traditional supply/demand concerns. Investment demand and hording are the catalysts of nearly every silver bull. Silver is called the "poor man's gold" for a reason: investors tend to buy it because it is a cheaper alternative to gold. This makes its relationship to gold important. Gold is roughly 15 times rarer than silver. Back when both were considered money, this ratio didn't stray far. It took 15 to 20 ounces of silver to buy one ounce of gold. This relationship ended when President Nixon pulled the US out of the Bretton Woods Agreement, severing gold's connection to the US dollar. Since then, it has taken anywhere from 27 to 98 ounces of silver to buy one ounce of gold. Silver is more volatile than its richer cousin, rising far faster in bull markets and declining much more in bear markets. Because of this, the gold/silver ratio tends to be inversely correlated to the over-trend in precious metals. It peaks at the bottom of precious metal bear markets and bottoms at the peak of bull markets. The chart below shows how many ounces of silver it takes to purchase one ounce of gold. Today's ratio of 84.49 ounces of silver to buy 1 ounce of gold is the highest since early 1991. Back then, silver traded as low as $3.50 per ounce, and the gold/silver ratio soared as high as 97.80. Not only is silver extremely overextended to the downside on an absolute basis, it is overextended vis-à-vis its historical relationship to gold. While cheapness is never a sole reason to buy anything, we believe silver is due for a bounce for other reasons, too. Let's look at some of the factors that make silver so cheap. Why Is Silver So Cheap? It starts with relative higher interest rates in the US. Higher rates increase the opportunity cost of holding physical silver and gold (which earn no interest). Higher interest rates in the US also help increase the strength of the US dollar. Capital will chase the highest returns and, for now at least, American interest rates are among the highest in the developed world. Investors need dollars to buy US Treasury debt. A stronger American currency means it takes fewer dollars to buy a fixed amount of silver. Silver may have declined versus the dollar - but it has soared in Turkish lira, Russian rubles, Iranian rials and Argentine pesos as those currencies have collapsed due to financial mismanagement, US sanctions, or a combination of both. Add in an attractive bull market in American stocks, and it's easy to see why the poor man's gold gets no respect. However, many of the factors behind silver's malaise are showing signs of change. Let's start with the US dollar. The Federal Reserve has raised interest rates numerous times while Europe has kept theirs at a negative yield. One would have guessed that the increasing American interest rate would have sent the greenback rocketing higher. But that hasn't happened. The dollar has gone nowhere since negating its uptrend in 2017 - and has weakened again a basket of the world's major currencies. What is holding it back? Is it the Trump Administration's stated preference for a lower dollar? The political uncertainty arising from the same administration? The dollar hasn't budged despite Mario Draghi's and the European Central Bank's decision to dust off their bond-buying Quantitative Easing (QE) operations and re-establish a negative interest rate environment. Ten-year German Bunds are almost there, trading for a yield just 4 basis points (4/100ths of 1 percent) as we write this. The US dollar should be soaring in this environment, but it isn't. Something is holding it back. The dollar peaked the first week of 2017. Is it weaker than it should be due to Trump's tariff policies - or it is something else? It is still too early to tell. What is certain is that despite negating its bull market and five-year sideways drift, the dollar is still too strong to put any kind of dent in the trade deficit that has plagued the US for decades. The trade numbers for 2018 are in, and they are not pretty. 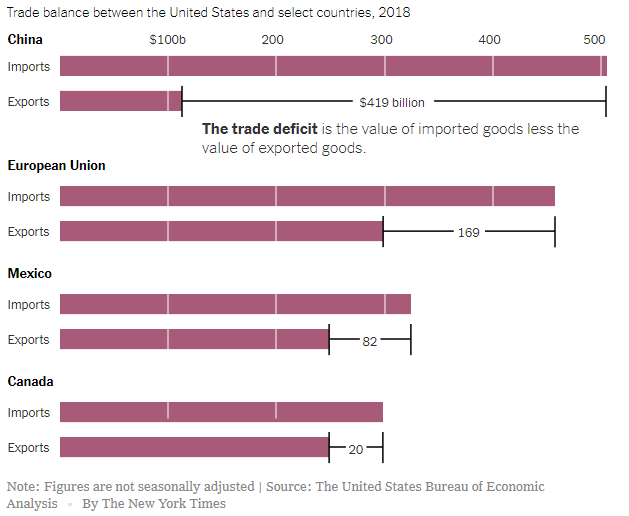 The problem with tariffs is they reduce China's demand for American goods at the same time the strong dollar encourages Americans to purchase Chinese goods, even with the tariffs. If President Trump wants a "win" on trade, he is going to need to campaign harder for a lower dollar. A lower dollar is bullish for commodities in general and for silver in particular. Silver may be bottoming after making higher highs for the first time since May 2017. This is even more impressive when you consider that it has had virtually no help from the dollar at all. Note the similarity of the current price action to the last bullish pop that began in December of 2015. A series of closes over February's high of $16.20 per ounce would be a bullish development, setting the stage for an assault on our first upside target of $18.50 per ounce (See chart below). Take that out, and $19.50 and $21.50 come into play. There is also the possibility that silver remains sideways for a while longer. The strategy outlined below is designed to give RMB Group trading customers upside exposure to silver for a lower cost and risk than purchasing the metal outright, freeing up capital to generate a return somewhere else. The options we are going to use are the 5,000 ounce COMEX silver options. Each option covers 5,000 ounces of silver, making each 1 dollar move worth $5,000 and each 1-cent move worth $50. Buyers of silver call options pay money, known as a "premium," for the right but not the obligation to be long silver futures at a specific price for a specific period of time. Call option buyers are not buying the market; they are merely buying the right to be long that market. When you buy a call option, you are essentially "leasing" the right to profit from higher silver prices. The key phrase is "but not the obligation." Should silver decline or fail to rally before the option expires, the option buyer will simply not exercise the right to buy the futures contract. All the silver option buyer risks is the premium paid for the silver call option (plus any transaction costs). Silver call option sellers receive money in exchange for the obligation to sell silver futures for a specific price for a certain time frame. Notice how this definition is the exact opposite of call option buyers. Think of it this way: if you are an employer, you pay money to your employees. This gives you the right to tell them what to do. As an employee, you receive money from your employer, obligating you to do what your employer tells you. Options work the same way. We will combine buying silver calls and selling silver calls to create the silver part of our strategy. As we write this, July 2020 silver futures are trading at $16.00 per ounce. That makes each 5,000 ounce futures contract worth $80,000. Our upside target on silver is somewhere north of $21.00 per ounce. What we want to do is buy a July 2020 $18.00 call option and simultaneously sell a July 2020 $21.00 call. The "bull call spread" described below pairs the right to buy silver at $18 per ounce with the obligation to sell silver at $21. As of the close on March 12, 2019, the July 2020 $18.00 silver calls we want to buy cost $3,600. The $21.00 silver calls we want to sell cost $1,750. Buying the $18.00 call while simultaneously selling the $21.00 call makes our net cost $3,600 minus $1,750 or $1,850. This (plus transaction costs) is the most we can lose on this trade if silver fails to rally past $18.00 prior to the expiration of the July COMEX silver options on June 25, 2020. Let's say silver rallies to or above our target. We could exercise our right to be long at $18.00 per ounce. Since we have a corresponding obligation to sell silver at $21.00 per ounce, the most our spread would be worth is the difference of $3.00 per ounce. $3.00 times the 5,000 ounce contract size is $15,000. Not bad for a $1,850 risk. Bull Call Spread In Silver - consider placing an order to buy July 2020 $18.00 COMEX silver calls while simultaneously selling an equal number of July 2020 $21.00 silver calls for $1,850 or less. We're looking for silver to rally above $21.00 per ounce prior to option expiration on June 25, 2020. We can now take the $80,000 we didn't spend on physical silver and invest it in a safe, interest-bearing investment like a CD. As we write this, the best rate for an 18-month CD on Bankrate.com is 2.92%. Eighteen months of interest at 2.92% on $80,000 is roughly $3,540. By pairing this CD with the bull call spread above, you've essentially created your own silver-backed CD. It's like earning interest on your silver. You've also lowered your total risk. Subtract the $1,850 cost of the trade (assuming silver does not rise above $18.00 per ounce) from $3,540.00 in interest from your CD and the worst you can do is collect $1,690 in remaining interest. Compare this with purchasing silver outright. Not only do you have to pay markups on your initial purchase, but you also have to pay monthly storage costs. Worse still, you forfeit the interest you could have made in a safe investment like a CD. Let's say silver doesn't rise. You have plenty of capital to re-enter the market using a similar strategy assuming interest rates cooperate. Prices for this strategy will have changed by the time you read this, but you should be able to construct a similar strategy. Visit RMB Group to learn more. This material has been prepared by a sales or trading employee or agent of R.J. O'Brien & Associates ("RJO")/RMB Group and is, or is in the nature of, a solicitation. This material is not a research report prepared by a Research Department. By accepting this communication, you agree that you are an experienced user of the futures markets, capable of making independent trading decisions, and agree that you are not, and will not, rely solely on this communication in making trading decisions.